By peering at the distant reaches of the universe through agalactic magnifying lens, astronomers may have found a way to better understandmysterious dark energy, which is thought to be speeding up the expansion of thecosmos. Though scientists don't know whatdark energy is ? nor have they proven definitively that it exists ? theythink it is the force causing galaxies to stray away from each other at anever-quickening pace. Dark energy is the name given to whatever stuff ispermeating the universe and causing this surprising accelerated expansion.. 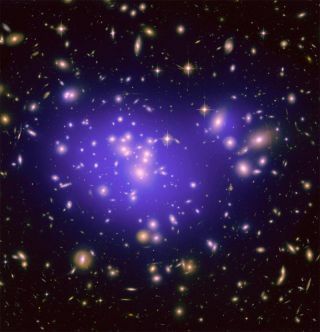 The researchers examined 34 pictures of these far-awaygalaxies, taken by the Hubble Space Telescope and ground-based observatories,to study the geometry of space-time. This property is thought to be influencedby darkenergy, which makes up about 72 percent of all the mass and energy in theuniverse, scientists think. "The geometry, the content and the fate of the universeare all intricately linked," said researcher Priyamvada Natarajan of YaleUniversity in a statement. "If you know two, you can deduce the third. Wealready have a pretty good knowledge of the universe's mass-energy content, soif we can get a handle on its geometry then we will be able to work out exactlywhat the fate of the universe will be." The researchers combined their measurements of the bentlight ? a phenomenon known as gravitationallensing ? with previous calculations of the universe's geometry based onobserving supernovas, galaxy clusters and other heavenly objects. Together,these clues helped narrow down estimates of dark energy's properties. "Using our unique method in conjunction with others, wewere able to come up with results that were far more precise than any achievedbefore," said co-researcher Jean-Paul Kneib of the Laboratoired'Astrophysique de Marseille in France. Ultimately, the researchers were able to refine estimatesfor dark energy's so-called equation-of-state parameter, called w, which relatesto how dark energy shapes the universe. They were able to reduce theuncertainty in this value by about 30 percent. The new findings are detailed in a paper published in theAugust 20 issue of the journal Science.